Our final weeks in Paris were a blitz of activity: packing, exams, graduation ceremonies, logistics and of course eating all those things we’d miss once back in Singapore. I love crepes and their savory siblings, the galette, so I made it a point to have crepes not once but twice before flying home. 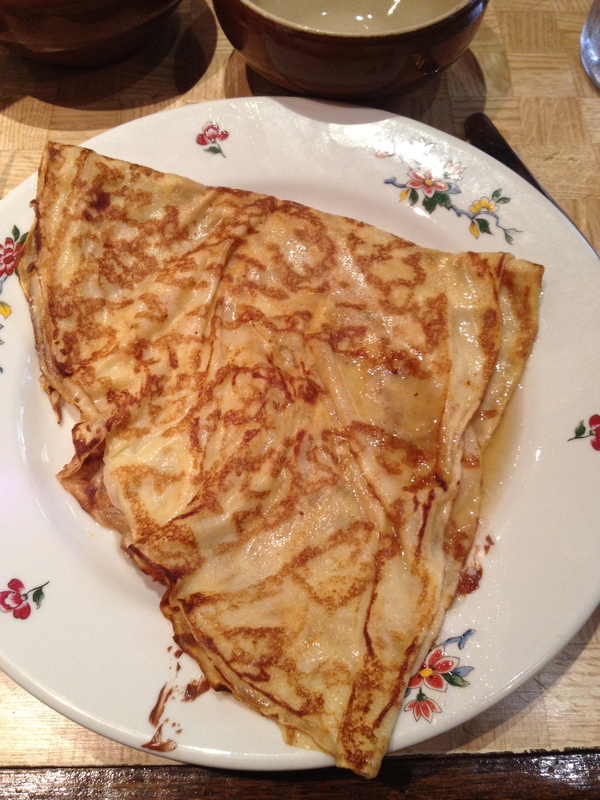 I revisited Creperie Josselin with the husband. The small, quaintly decorated creperie is the busiest on this stretch of Montparnasse (and some contend the best creperie in Paris), and our favorite where we return faithfully to each time the crepe craving strikes. 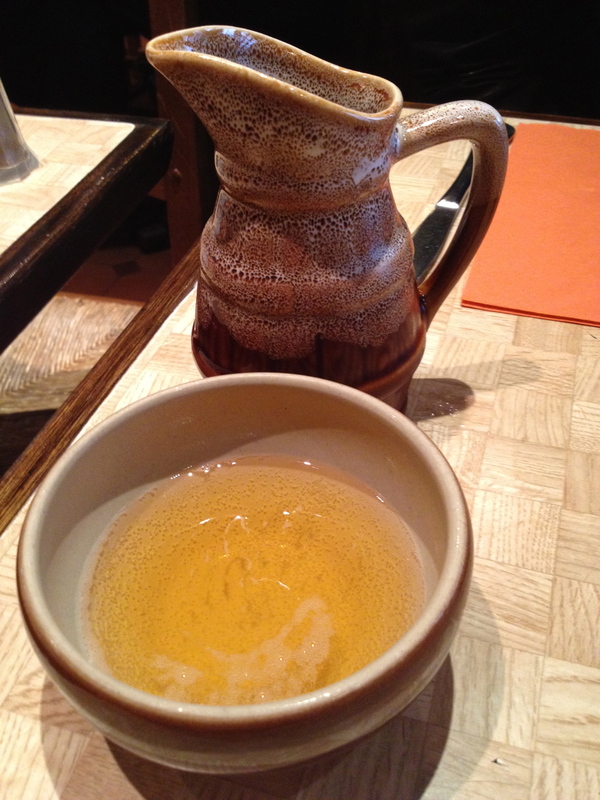 We tend to frequent Creperie Josselin during the afternoon to take advantage of the lunchtime formule: a 10e deal that includes the galette complete (stuffed with cheese, egg and ham), a sweet crepe, washed down with a pitcher of Brittany’s cider. 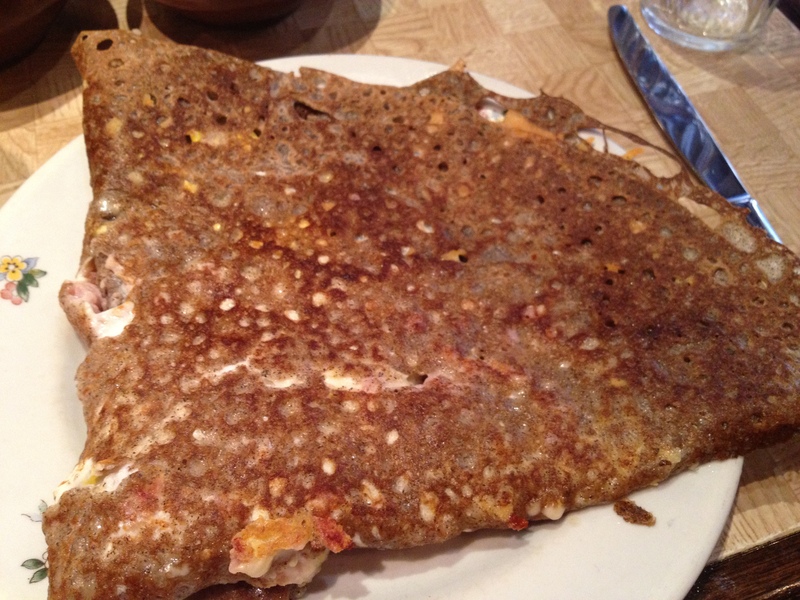 Their galettes are nothing fancy, just nut-brown buckwheat pancakes filled with simple fillings. But they come in my preferred texture, thin and crispy with crunchy lacy edges and are ultra filling despite the diminutive size. Crepes to me is comfort food, homely but satisfying. More often than not, I find the simplest variations the best. 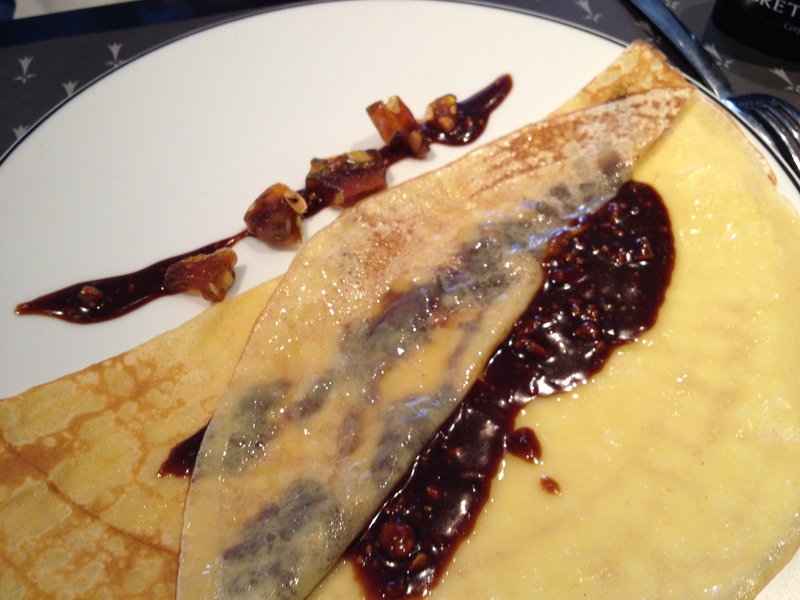 Thus the default crepe fillings for us are usually a smear of nutella or a drizzle of honey and lemon juice. So far, these choices have not failed us yet at Creperie Josselin. If Creperie Josselin is a homely aunt, La Compagnie de Bretagne, a new creperie/restaurant is its urbane, sophisticated younger sister. Upon entering the spacious, tastefully decorated triple-storied restaurant for my date with J, my perception of creperies as casual, no-frills establishments were immediately challenged. 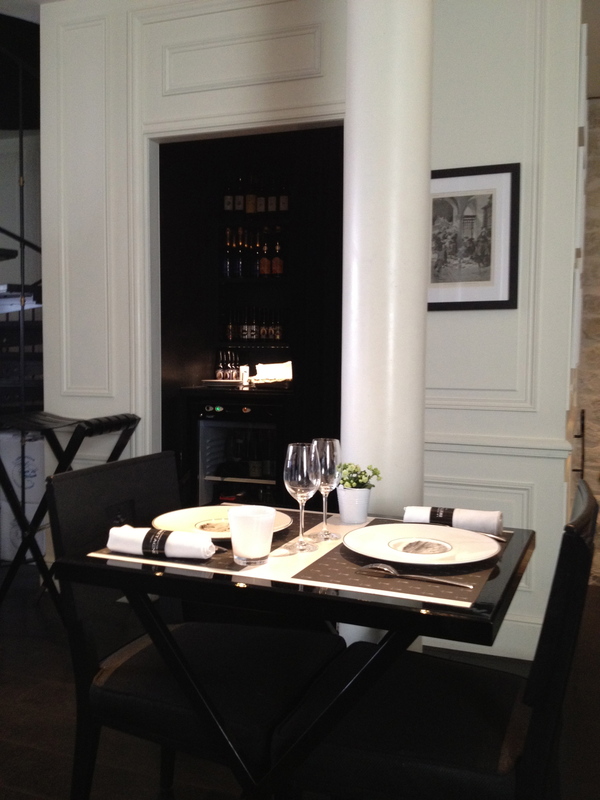 While the husband and I were packed cheek-to-jowl at Josselin, J and I were seated in a comfortable black and white 2-top on the rez-de-chausée with a view of the glass-enclosed kitchen and much more space between us and our neighbors than I’m accustomed to in Paris. The menu is also more sophisticated than the regular creperie offerings, not surprisingly given that the restaurant has famous Breton chef Olivier Roellinger as its consultant. Products are seasonal and sourced from Brittany, so alongside regular creperie offerings like the galette complete and the crepe au caramel beurre salé, one also finds galettes filled with flavorful seasonal asparagus, oysters from Cancale and meaty Brittany lobster. Even the galettes and crepes are folded with more care, first halved then folded asymmetrically to reveal a glimpse of the stuffing. 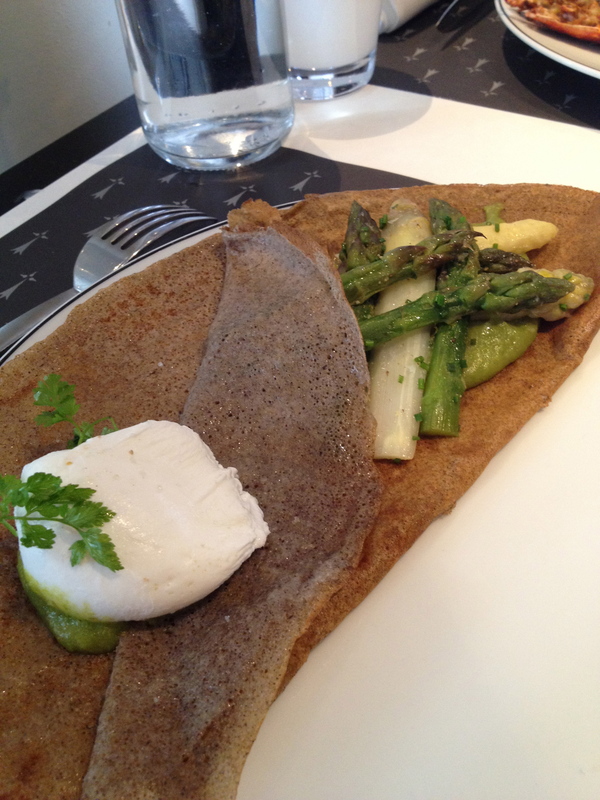 Taste-wise, the white and green asparagus on my galette was delicious, though I prefer the crispier texture of Creperie Josselin’s galettes. 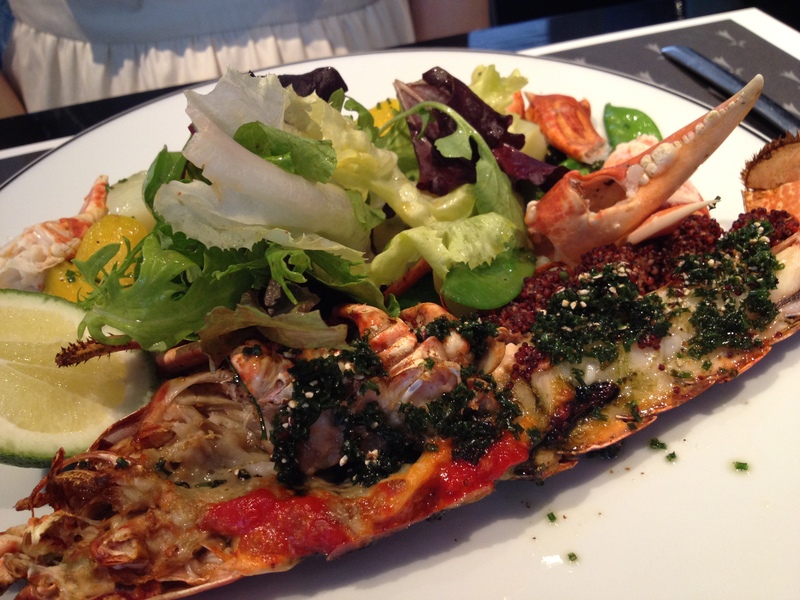 J thoroughly enjoyed the grilled lobster – sweet and firm meat accentuated by rich Breton butter – that the kitchen had kindly halved for her even when the menu stated it was a dish for two. I guess her baby in the belly technically counts as another person. The dessert crepe offerings presented several intriguing options. No Nutella on this menu, though the crepe with praline cream and candied nuts was a worthy substitute. La Compagnie de Bretagne is definitely more expensive, with the à la carte menu priced at least 30% higher than Creperie Josselin. In return, one gets luxe ingredients, better service and more room. 2 creperies to suit different occasions, both of which I will miss. 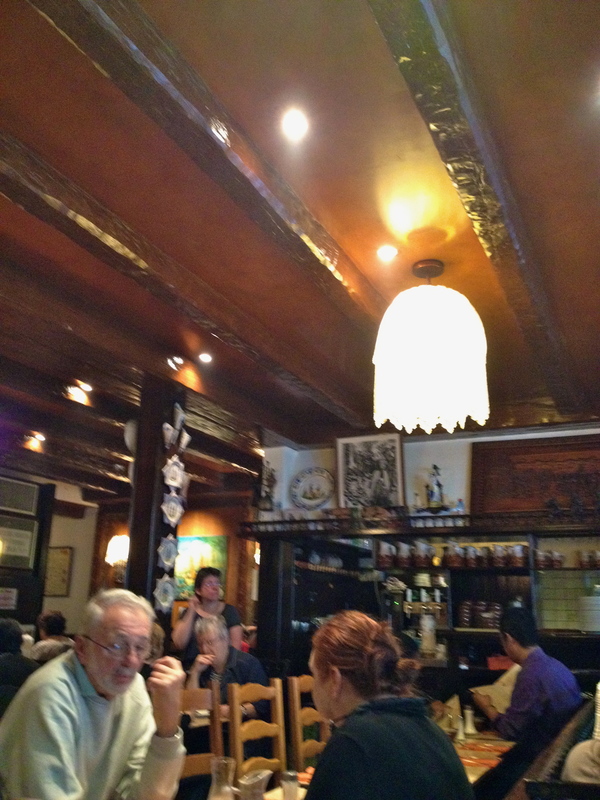 This entry was posted in 14th arrondisement, 6th arrondisement, Crepes, Cuisine, Eat out, dine in, eating out, Location, Paris and tagged montparnasse, paris best creperies. Bookmark the permalink.